Messaging and texting is one of most performed tasks on an Android smartphone. With it’s vast library of apps and tools, you will find several applications on the Google play store for texting. Some of them are used to send onLine messages while some can provide your default messaging app a completely new look. 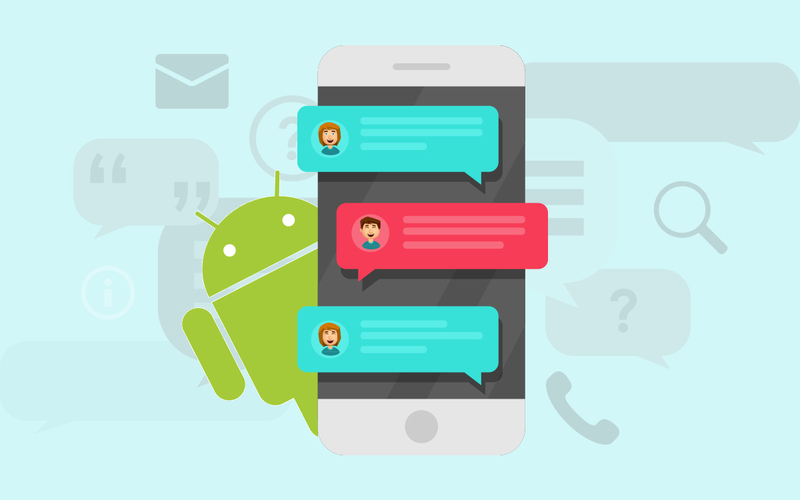 In this article, we are listing 10 best messaging apps for Android that allow you to connect with more friends in a better way. The app deserves to be on the top of the list when it comes to the best texting and messaging apps. You will find almost everyone from your friends here. Whatsapp allows you to share images and other files in bulk. You can make group of your friends or family. To share your life stories it has a redesigned status feature. You can use this app to make voice or video call and for sending voice messages as well. If you want to chit chat with your Facebook friends with whom you have not shared your contact number then this dedicated messaging app from Facebook is the best texting app. It is known for doing its job perfectly you can see when your friends are onLine you can get delivery and read receipts, make video or voice calls and can send funky stickers. In some countries, you can even send money through Facebook Messenger. Hope you have heard about Gtalk from Google. There was time when it was a famous web messenger from Google.But as we started using our smartphones more than our computers, Gtalk became Hangouts. Like other messengers you can use Hangouts to make voice/video calls, to share location and files. The best thing about this messenger is that it works with Google account. Since every Android user must have Google account to download applications,they can easily chat over Hangouts. For a long time, Viber was known for high quality voice calls earlier the app was a dialer on which you can add credits to make Internet to phone calls. Internet to Internet calls were free. On the current version of Viber, you can make voice/ video calls send text messages with funky stickers and emoticons and it is considered as one of the most secure messenger on the play store. You can delete sent messages which makes is one of the best texting app. If you still have some of your friends using feature phones and you keep in touch with them using simple texting app then Go SMS pro is the app which will make sending SMS full of fun for you. With hundreds of personalized themes and emojis you will also get some attractive features such as dual sim text on one place. You can choose to send message with a delay so that you can review them before sending. With this app messaging will be fun and it can be considered as one of the best SMS app for Android. Another in our list of best messaging apps for Android is Snapchat. It is something more than normal text messaging. You can add friends to snapchat using snap code or from the contact list. You can view stories of your friends which are just small videos or photos. You can also comment on them by taping reply button they will receive it as chat message. Camera filters are something which add twist to your stores. You can also go for one to one chat with your friends but remember messages disappear as soon as your friend view them. With a Google assistant available for you 24×7 on the chat you can also chat with your friends on Google Allo. Add doodles or text on your photos and send them to your friends with more details. It is a messenger on which you can shout or whisper change text size with a quick swipe. In this messenger, you can enjoy incognito mode which helps you to keep chats private and you can also go for expiring chats in which you can control how long your messages will stick to chat windows. Best feature of Google Allo is Google Assistant because if no one from your friends is available to chat then too you can chat with Google assistant. Telegram is one of the best texting apps on the play store. It is having some amazing features which makes it to stand out of the crowd. The application claims to be the fastest messaging app on the play store. Your chat data remains safe on the cloud and because it does not occupy the space on your disk the application becomes light weight. There is no limit of file size or number you can send as many as you want. Another application in our list of best messaging apps for Android is Line. Here you can meet strangers and can chat with friends. If you are planning to meet your old friends and do not want to get into lengthy discussions of venue then you can create polls with this app. With Line, you can make calls to mobiles and landLines to almost every part of the world on very nominal rates therefore it can be used as dialer or SMS sending app too. Because of its compatibility to send messages as SMS also it is the best SMS app for Android in the opinion of some users. If Blackberry was your previous phone or some of your friends are on BBM then do not worry. BBM is now on the play store. You can add someone with BBM pin or from your contacts. BBM is loaded with funky stickers and you will see delivery and seen receipt on the sent messages. The app allows you to react on a message and can share your location with a time limit. So, these were best messaging apps for Android. Load your Android device with them to have fun with friends and to share your life moments with them.